Friday, March 18 at 7 pm. It is said that each creative person lives in their own world. A painter sees the world through colours, a writer listens to the rhymes of words and a musician feels the world through music. Marian Varkholik has chosen an extraordinary style of art. Out of ordinary matches, he builds incredible masterpieces. To date, he has created many of his own works. Among them, he has created musical instruments, decor items, castles and stadiums. Over time, Marian has created bas-relief pictures. Originally, this was all experimental, his works were small and represented different themes, but this was not enough for the artist. His goal was then to beat the national record of Ukraine. He then went on to build the largest bas-relief picture in Ukraine. Marian keeps on creating interesting projects representing different topics. His love for Ukraine has also inspired him to create beautiful Ukrainian embroidery. In 2015, he came to Canada where he also created logos for NHL Hockey teams. Some of the teams he created logos for are: Calgary Flames, Edmonton Oilers, Montreal Canadiens, Ottawa Senators, and Toronto Maple Leafs. 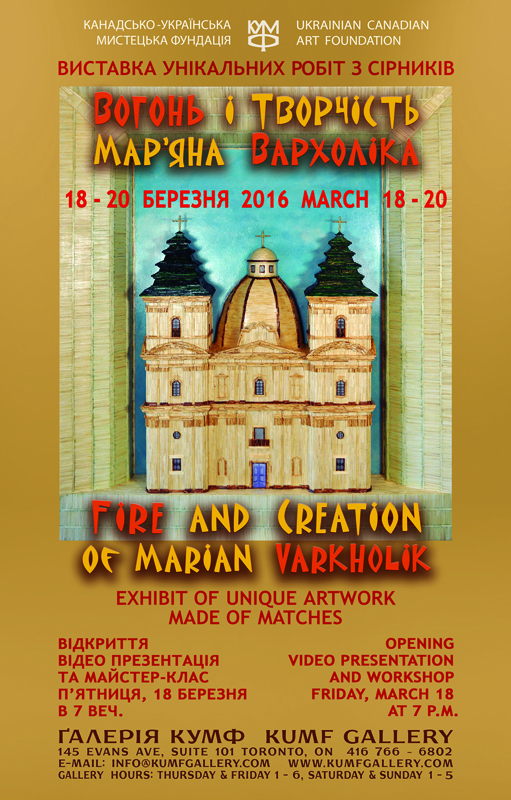 As an artist, Marian has had many solo exhibits of his work and has done many Master Classes in Ukraine. Marian Varkholik is considered to be a Master of Folk Crafts Spatial Modelling.